When I was a teacher trainer, we used to debate whether trainee teachers should be introduced to learning theory before or after they went into the classroom to teach. As luck would have it, Claire Major, a participant on the course, is writing a book on how teaching online changes our work as teachers and so has a particular interest in learning theories – and this led to some great discussion and outcomes. 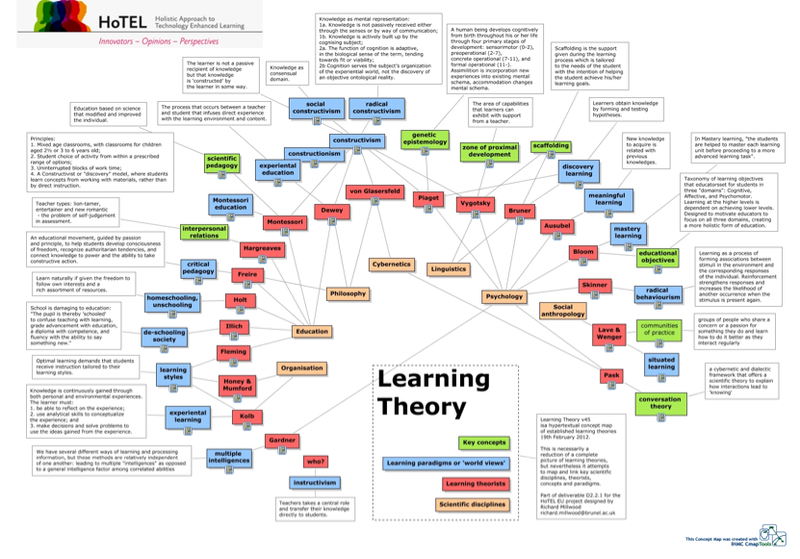 Claire bemoaned the fact that what has been written on learning theories seems to be a confusing mess and said she needed a diagram to pull it all together. I agreed. Donald Clark wrote a series of 51 blog posts, each about a different learning theorist. 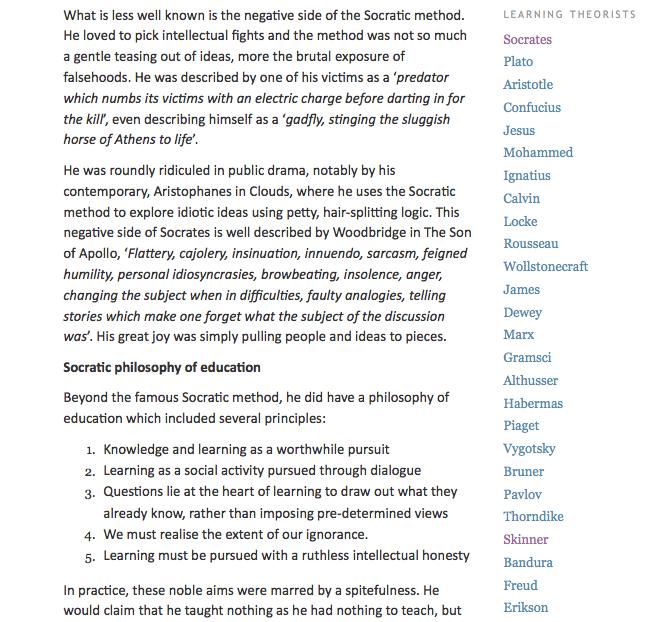 Here is a screen shot taken from his first post in the series about Socrates. But this is not the diagram that Claire was looking for. However, inspired by Claire to hunt for a diagram I found this cMap by Richard Millwood for the Holistic Approach to Technology Enhanced Learning Project. But ultimately Claire took up the challenge herself and produced this presentation which she has shared as her final presentation for the Pedagogy First course. What a great final outcome to a 24 week course! Next Article FSLT13 – What is learning? Hi Jenny, thanks for the reminder to check back into Pedagogy First. I must have missed the theory discussion:-( At our college the theme for online training has been aspects of “classroom” organization and a bit of how to use the technology to accomplish this. I wonder if it is just assumed teachers through experience will gradually develop a technique that includes a kind of folk-theory of knowledge transfer and development? One of our instructional designers is working with a subject matter expert to create a program he will be teaching and both are struggling with how to make the course something more than manuals and exams. Adding theory is slowing the process down and if there is any rule for course development here, number one task is to meet ridiculous deadlines. Hi Scott – thanks for your comment. My feeling is that everyone who teaches or designs for teaching must have some beliefs about what works best for their learners, even if they don’t know much about learning theories and can’t articulate what they are doing in terms of theory. Perhaps all that’s needed is to talk more about theory and in particular to talk more about it in straight-forward ‘feet on the ground’ terms which can be related to practice? Thank you for finding this, Jenny! I hope I can use it for the class – it’s certainly the best use of CMap I’ve seen (never liked that program). Great blog post! I do really like the mind map you found and thank you much for directing my attention to it! I’ve just been working a bit on this chapter today and have been checking out your stuff on emergent learning. Very cool, you! Wrestling with it now, and indeed may soon want to figure out a way to chat with you about your ideas on complexity and your emergent learning model….